Of all the portraits I’ve ever come across – and believe me, I’ve been going to museums since I was a wee one – the portraiture of ancient Egypt fascinates me the most. For one thing, Egyptian artists depicted people of every station in life, from pharaohs to common people grinding grain. Egyptian portraits provide an awesome glimpse into the sacred, the believed-to-be-sacred, and the everyday, and provide a unique document of a society thousands of years old. I especially like this portrait of Prince Ankhhaf, because it digresses from the rigid canons of Egyptian art that were established early in the Old Kingdom (c2650-2323 BCE). When you look at this guy’s face, you see a real person with personality! The cultures of the ancient Near East and Egypt were among the first to produce true portraits. In Egypt, portraiture, like most other art form genres, primarily served funerary purposes. Because the Egyptians believed they would be reborn essentially unchanged into the afterlife, portrait sculptures were important objects in the contents of a tomb. 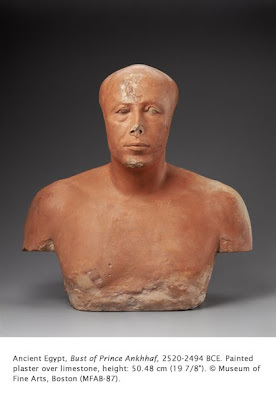 Busts such as this, which was housed within a chapel in Ankhhaf’s tomb, are called “reserve figures.” They were intended to house the ka (life essence or soul) in case the deceased’s body was damaged in any way before ascending to the other world. Royal portraiture of the time followed strict conventions and was rarely true portraiture. These conventions were based on a canon of proportions that accorded with the Egyptian concept of the ideal human form. Physical imperfections were ignored, in other words, the figures were idealized. These conventions were often disregarded in portraiture of lesser nobles or commoners. This is certainly the case with Ankhhaf. His features are those of a mature, aged man, with bags under the eyes, furrows around his mouth, and a receding hairline. It is indeed a sensitive portrayal of a successful prince. Compare this realism with the royal portrait of Menkaure, successor of Ankhhaf’s nephew Khafre. Ankhhaf was the son of pharaoh Sneferu (2575-2551 BCE), half-brother of Khufu (2551-2528 BCE) (builder of one of the great pyramids), and uncle to Khafre (2520-2494). Ankhhaf oversaw the building of Khafre’s pyramid and the Great Sphinx. This portrait was probably produced at the time he served Khafre. Over time it lost the ears, a small beard, and probably two arms that rested on the low pedestal on which it was placed. It faced the entrance to the chapel as if ready to greet otherworldly visitors. Ankhhaf’s mastaba (tomb), G7510, is the largest in the great eastern cemetery at Giza.